Caligrafías de la enfermedad. Letra de médico. Home > Caligrafías de la enfermedad. Letra de médico. Palau de Cerveró. Lluís Alcanyís and Manuela Solís Rooms. Who has not ever been in front of a doctor’s prescription trying to decipher what was written? Who has not considered on any occasion the reason why pharmacists understand the hieroglyphics written by doctors when they prescribe medicine? 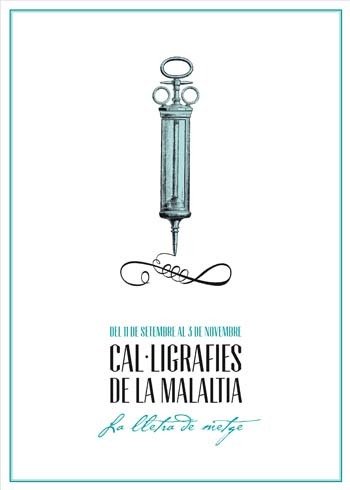 Caligrafías de la enfermedad (Calligraphy of diseases) is a university project that reviews handwriting as an element of visual culture. 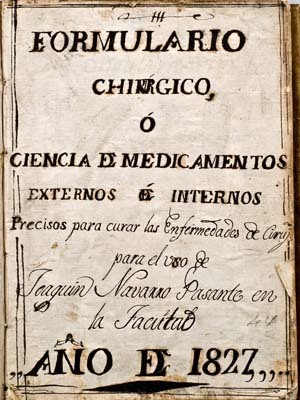 The exhibition, presented in the Palau de Cerveró, headquarters of the López Piñero Institute for the History of Medicine and Science of the University of Valencia, aims to integrate a number of issues rising from doctor’s handwriting. We recover a tradition and demand the scriptures and texts as pieces of visual art. Caligrafías de la enfermedad is a new project as a concept, while recovering historical documents of great heritage value, such as texts written by doctors and medical researchers. Considering a dissemination approach that was very innovative in several European countries during the last decades of the last century, but which has not yet had any impact in the field of medicine, various aspects are integrated in Caligrafías: medicine, calligraphy, visual arts, diagnoses, prescriptions, records, readability, family sagas, the relationship between physicians and pharmacists and other aspects that cause synergies in an unusual pleasure. At the same time the wealth of writing is rediscovered in a historical moment in which handwriting has been displaced by computer keyboards and other communication technologies. The exhibition Caligrafías de la enfermedad. Letra de médico is organised in 7 connected areas, in addition to a powerful and important Educational Area. Area 1. Médicos, escrituras y universidad. Grandes personalidades y rastro gráfico (Physicians, writings and university. Great personalities and graphic trace). The University of Valencia promotes this new initiative on the physician’s handwriting and their popular tradition. The exhibition presents some examples of the rich heritage that keeps our university in terms of documents and handwritten texts by prestigious doctors. Area 2. La extraña escritura de las enfermedades. La dificultad para leer la letra de médico (The strange writing of diseases. The difficulty of reading doctor’s handwritings). The Valencian doctor V. Sorribes Santamaria spent the summer of 1941 in the Fontilles Psychiatric Hospital. The book Cuaderno de Fontilles: un joven médico frente al fantasma de la lepra y la postguerra (Fontilles Logbook: a young doctor facing the ghost of leprosy and postwar)(2008) tells this story. The help of a prestigious paleographer to decipher it was needed given that it was a very complicated reading. Area 3. Creación gráfica y sagas familiares (Graphical creation and family sagas). 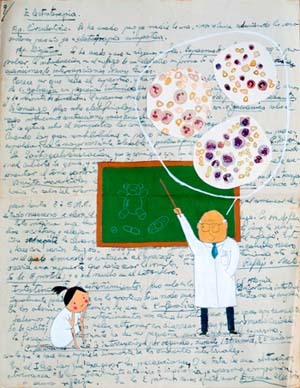 Introduction of the artwork of the designer Tana Capó, who has made a series of paintings and collages from documents written by her grandfather, a doctor and collector of fountain pens. Tana Capó’s uncle, son of the doctor mentioned, is a physician and professor of medicine at the University of Valencia. Area 4. Médicos farmacéuticos, recetas y consejos en las comarcas centrales valencianas (Pharmaceutical Physicians, prescriptions and advices in the Valencian central regions). The family saga initiated by Francisco Galindo has been continued for three generations of family doctors in Ontinyent. Grandfather, father and son review, through its graphic account, a tradition that has ensured the health of a town which is a geographical referent of the traditional industry. La Vall d’Albaida University Foundation participates in the project and it also will start the tour of the exhibition which will travel to Ontinyent. Area 5. El arte de la caligrafía china. La caligrafía china es un verdadero arte (The art of Chinese calligraphy. Chinese calligraphy is truly an art). From Confucious Institute involvement in this project we will approach the visual and artistic potential of Oriental medical writings. Area 6. Comunicación entre profesionales, territorio no apto para profanes (Communication between professionals, territory not suitable for not experts). A space dedicated to the relationships between communication, writing and diseases. Educational Area. Scenery set in a medical clinic. We will encourage visitors to dress as doctors and to have a picture taken while writing a prescription. These prescriptions will be posted on the walls of the space dedicated to educational activities. Students of the diploma Artistic Education and Management of Museums will develop educational materials for the visitors’ different ages: kindergarten, elementary and high school students, older people, families and groups.